If you are looking to invest, the Seven of Pentacles suggests that you are ready to put in a lot of effort, time and work into whatever you want to achieve. It reaffirms you of your long-term vision and helps to show that you are not confined to seeing results in the short term only. It shows how much you value the investment because of the effort that you are willing to put in. It reaffirms you of your long-term vision and helps to show that you are not confined to seeing results in the short term only. The Seven of Pentacles is also related to fear of failure. You do not know whether you are going to reap fruit from your hard work. It could also signify frustration when there is a delay. You may have been putting a lot of effort into your projects, but it does not seem to bear any fruit right now. The good thing is that it means that you are learning from your failures and mistakes. It may initially not seem like it, but mistakes allow you to look into how to better invest your time to get the most out of your future ventures. 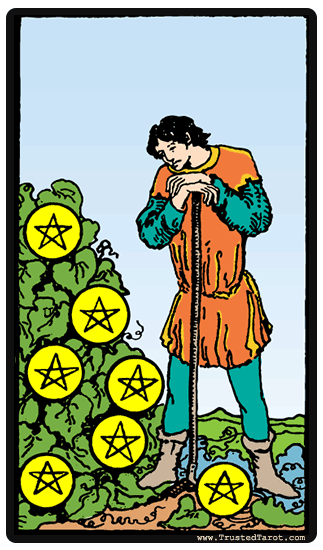 The Seven of Pentacles reversed means that your returns may be scattered for now. It could also mean that the rewards of your labor are not as significant as you thought. The advantage of this is that it shows that you know when to stop investing your time, money or energy in a particular project. You, therefore, need to reevaluate your choices, and figure out where you should put your resources. The Seven of Pentacles reversal meaning could also be applied to relationships and the effort and emotions that you have invested. The Seven of Pentacles symbolism often deals with business ventures and investments. However, it also cuts across relationships, viewed as investments as well. The effort put into these investments could be time, money and hard work.